where the result depends on the patient’s ability to discern changes in clarity. This process relies on the cooperation of the patient. where the result depends purely on the examiner’s judgement to determine the optimum optical correction. An autorefractor can also be used to obtain an objective refraction accessing tool. Subjective refraction consists of three distinct phases. The First Phase: This is designed to correct the spherical element of the refractive error in such a way as to facilitate the accurate determination of any astigmatic element present. The Second Phase: This phase is to determine the astigmatic error. It should be remembered that, although astigmatism is often present, a refractive error may be entirely spherical. The Third Phase: It involves the balancing and/or modification of the refractive correction to ensure optimal visual performance and patient comfort. As always, the patient’s history and symptoms are important and can be used to help predict a refractive error. Remember that a symptom is a patient’s complaint whereas a sign is a practitioner’s observation. • Good near vision on a near test chart. • Eyestrain, especially for close work, caused by the accommodative effort to form a clear image. • Blurred vision with medium-to-high amounts of hypermetropia and in advancing age (blurred vision is not usually a problem with low amounts of hypermetropia). • A nasalward deviation (esotropia) of one eye in high amounts of uncorrected hypermetropia. Objective refraction (retinoscopy) is often used to determine the initial spherical element of refraction. However, when a patient has a recent correction that is providing good acuity, say 6/9 or better, this can be taken as the starting point. The purpose of the first phase of a subjective refraction is to determine the best vision sphere (BVS). This can be defined as the most positive (or least negative) spherical lens that provides best visual acuity. During a subjective refraction, the accommodation must not be allowed to fluctuate randomly. The eye should be as relaxed as possible so that changes in the accommodative state do not influence the end-result. As the accuracy of any subjective test or routine relies on the individual patient’s ability to discriminate and communicate accurately, the potential for error must be kept to a minimum. The ability to discriminate and communicate will of course vary widely from person to person but, in general, the simpler the task, the more likely it will be performed well. To determine the BVS a suitable letter chart (logMAR or Snellen), trial frame and trial case of lenses are required. The following discussion takes place in two parts: the first assumes that retinoscopy has not been performed whereas, in the second, the determination of the BVS follows retinoscopy. If a good retinoscopy has been performed, the technique of finding the BVS in isolation should, in theory, be redundant. However, it can prove useful when retinoscopy is difficult (small pupils or media opacities). It is usual to start with the right eye, the left being occluded. This is called a monocular refraction. The procedure is repeated on the left eye with the right occluded. However, it is possible and often preferable to refract under binocular conditions. In both binocular and monocular refraction, it is important to control accommodation in the person with pre-presbyopia, so a ‘fogging’ technique is employed whereby the spherical element is deliberately over-plused and then reduced to find the final spherical power. Traditionally, the right eye is usually refracted first, because it is the nearest one to the practitioner in most consulting rooms. However, when the left eye has significantly worse acuity as a result of amblyopia or pathology, or if the right eye is markedly dominant, the left eye should be refracted first. When using the best sphere technique without the aid of retinoscopy, the practitioner must find the maximum amount of positive power or the minimum amount of negative power that can be tolerated by the eye, without causing blurring of the retinal image. After occlusion, the first task is to measure the unaided vision. This is useful because unaided vision can give a reasonable estimate of the magnitude of any uncorrected myopia or manifest hypermetropia. Is the target better with or without this lens, or is there no real difference? Positive lenses either blur the retinal image, indicating that the maximum amount of positive power is already in place, or relax accommodation (where it is in use). Therefore an answer of ‘no difference’ indicates the need to add positive power to the trial frame combination of lenses until no more can be tolerated. The initial plus lens may be in the region of +1.00 DS. Later in the procedure, a +0.50 DS may be used. When the total power of the trial lenses in the trial frame is close to the endpoint; the practitioner should add spherical lens power in 0.25 DS steps. The lens must be held in the plane of the trial frame and along the visual axis to avoid inducing off-axis aberrations. It should also be moved quickly and precisely, allowing enough time in each position for the patient to make a decision. Some patients require longer than others. Practitioners usually need to repeat this process a number of times to confirm the result and continue to add positive power until the addition of an extra +0.25 DS results in blurring. This final +0.25DS are discarded and the remaining lens is the best vision sphere. Is the target clearer or just darker with this lens? Should the target appear darker but not clearer, extra minus power should not be added because this just stimulates accommodation. Also, extra minus power should not be added if the target appears smaller but not clearer. A negative lens should be added to the trial frame only if the patient can resolve a greater number of letters on the letter chart. The results are often rechecked and confirmed throughout the test using the same or a different technique, e.g. best sphere and duochrome because patient’s answers are frequently inconsistent! When the BVS has been reached the point focus (in the case of spherical ametropia) or disc of least confusion (in the case of astigmatic ametropia) should be on or very close to the retina. The distance vision with this correction should be measured and recorded because it is useful for estimating the magnitude of any uncorrected astigmatic error. The use of ±0.25 DS ‘twirls’ helps in fine-tuning the BVS. Remember that the endpoint is the maximum plus or minimum minus that the patient will tolerate without causing blurring of the retinal image. 1. Occlude the left eye. 2. Measure the unaided vision. 3. If possible, estimate the ametropia. This is particularly helpful in the case of uncorrected myopia. Also in myopia, the position of the true far point can be used to estimate the refractive error), e.g. a person with −8.00 D myopia sees clearly if a target is placed at approximately 12.5 cm from the eye. 4. Add a +1.00 D sphere. 5. Is the vision worse? 6. No: add more plus spherical power until the vision blurs. From the blur point, reduce by +0.25 DS. The BVS should be the maximum plus that the eye can tolerate without causing blur on a letter chart. 7. Yes: add minus spherical power until the best line can be resolved. Make sure that each addition actually increases VA and does not just make the letters smaller. 8. If possible, adjust the final sphere on the letter chart and/or the duochrome using a ±0.25 DS twirl. 10. Occlude the right eye and repeat the procedure for the left eye. 1. If the working distance lenses are +1.50 DS, the over-correction provided should blur the acuity back to 6/24 in a young patient. However, in a patient with small pupils the acuity may be rather better. An occluder is placed before the left eye. 2. The acuity of the right eye may now be checked with the left eye occluded and the right working distance lens still in place. In a young patient this should be around 6/24 and, if it is better than this, the retinoscopy result may be under-plussed. In older patients the effect of the overcorrection may be less, but it is also less likely that retinoscopy under-plussed the correction if accommodation is inactive. 3. If the VA with the working distance lens in place is around 6/24, remove the working distance lens and refine the BVS. If the acuity with the working lens in place is better than 6/24, the retinoscopy result may be under-plussed and a smaller amount of positive power should be removed. After retinoscopy the spherical correction may be refined by use of the duochrome or by using plus and minus spheres of equal but opposite power. The two methods give statistically similar results (Jennings and Charman 1973), although this does not mean that they necessarily agree on every patient. It may also be determined by a ‘coincidence’ method employing the Scheiner disk. This method has been commonly employed in optometers and some autorefractors. It is also employed as the focusing mechanism in the one-position keratometer. This technique relies on the sequential presentation of plus and minus spheres, which are usually mounted together in a ‘twirl’ with a handle, although individual trial lenses may be used. The lenses presented are normally ±0.25 D. However, if the VA of the eye after retinoscopy is less than 6/9, it is unlikely that the patient is able to differentiate reliably between these low-powered lenses, so ±0.50, ±0.75 or ±1.00 D twirls may be required. Using this technique, the plus lens must be presented first for at least 1 second to relax accommodation. The minus lens should not be held for more than 1 second, which is the reaction time plus response time for accommodation. If this time is exceeded, it is likely that the patient will accommodate. The patient should be asked: ‘Are the letters clearer with the first lens or the second lens or are they both the same?’ It is useful to split the two halves of this question to avoid asking a multiple question. The initial comparison should be between more plus and more minus. The third option should be offered only if the patient could not differentiate between the first two. If the first lens is clearer or they are both the same, +0.25 DS is added to the trial frame. Additional +0.25 DS lenses are added until the VA first blurs. The end-point is the most plus or least minus that does not blur the VA. If the second lens is clearer, −0.25 DS is added. If acuity improves, add further minus lenses in 0.25 D steps only for as long as the acuity continues to improve. Ask: ‘Do the letters actually appear clearer or just smaller and blacker?’ If the letters look smaller and blacker but not clearer, do not add the −0.25 DS. Also, if the patient reports no change or a drop in acuity, do not add the −0.25 DS lens. The end-point is the most plus or least minus that does not blur the VA. The rapidity with which the minus lens must be withdrawn can cause problems when a patient is slow to react. For this reason, many practitioners have modified the Simultan technique to eliminate the minus lens completely. Are the letters clearer with the lens, without it or just the same? Are the letters the same with the lens or worse? The first variant has the disadvantage of being a compound question. The second may confuse because the +0.25 DS is often clearer. It is necessary to pick the question to suit the patient, and it is sometimes necessary to change the question once the practitioner has got used to the patient. If in doubt, try both variations in succession. If the patient finds the vision clearer or identical with the plus lens, +0.25 DS is added to the sphere in the trial frame and the sequence is repeated by presenting the +0.25 DS lens once more. If the patient rejects the plus lens, −0.25 DS is added to the sphere in the trial frame and again the sequence is repeated. With this method, accommodation may be induced when minus power is added to the sphere in the trial frame, but we are always adding plus, and therefore relaxing accommodation, immediately before the comparison is made. Both this technique and the unmodified Simultan method are repeated until the patient accepts no more plus without losing clarity. At this point the investigation of the astigmatic element of the refractive error can proceed. Where there is uncorrected ametropia, a distance point source of light produces a blurred image on the retina composed of a series of blurred discs. The dimensions of a single blurred disc depend on the degree of ametropia present, the diameter of the individual’s pupil and the distance of the point source from the eye. A pinhole may be employed to reduce the diameter of these burred discs and thus improve the VA. The pinhole disc is an opaque disc with a central circular aperture of about 1 mm in diameter. A pinhole with an aperture smaller than 1 mm would cause diffraction effects and also a reduction in retinal illumination. This would result in a dim, unfocused image. An aperture larger than 2 mm approaches the size of some human pupils and so might not significantly reduce the blur circle produced by an uncorrected refractive error. A diameter of 1.32 mm was recommended by Lebesohn (1950) as optimally balancing the opposing demands of reduction of the blur circle and diffraction, although the aperture most commonly seen is rather smaller (1 mm). If the pinhole is placed before an uncorrected ametropic eye, the VA should increase. Normally correction of the refractive error should improve the VA by at least as much as that produced by the pinhole. The pinhole disc can therefore be used to estimate the maximum VA that the eye would obtain if the refractive error were to be corrected. If acuity does not improve through the pinhole, it is unlikely that reduced acuity is caused by an uncorrected refractive error and pathology is suspected, e.g. the VA in amblyopia, macular disease and central media opacities is not improved by using the pinhole disc; in fact the pinhole disc may actually reduce acuity in such cases. However, if the patient has an irregular cornea or peripheral media opacities, the pinhole may give a better result than can be achieved by refraction. If the pinhole fails to improve VA, the reason for the reduced acuity is unlikely to be purely refractive. In practice, the pinhole disc test can prove very useful, especially if subjective techniques are unsuccessful and VA does not improve with the addition of lenses. The eye, in common with most optical systems, displays a certain amount of axial chromatic aberration (ACA). The refractive indices of the various optical components of the eye vary with the wavelength of the incident light, with light of longer wavelength (i.e. towards the red end of the spectrum) resulting in longer focal lengths than shorter wavelength light. The total amount of ocular chromatic aberration present has been estimated as approximately 2.50 D (Bedford and Wyrszecki 1957). With white light, this should cause some defocus, although placing an achromatic doublet before the eye does not appear to improve VA significantly. Chromatic aberration appears to be slightly reduced (about 0.30 D) with smaller pupils and rather more (about 1.00 D) with accommodation (Jenkins 1962), although the reasons for this are not entirely clear. It was for many years assumed that the eye would focus light from the middle of the spectrum on the retina in order to attain maximum VA. Rabbetts (1998) estimated that yellow light with a wavelength of 570 nm was preferred by the eye. If this wavelength is used as a reference point, as it often is for tungsten light, green light with a wavelength of 535 nm focuses 0.25 D in front of the retina and red light with a wavelength 620 nm focuses 0.25 D behind it. So, by using appropriate filters a test may be constructed that, by comparing the clarity of targets presented on red and green backgrounds, allows the practitioner to focus the yellow reference wavelength accurately on the retina and achieve maximum acuity. Such a test is known as the duochrome test. The exact filters used with the duochrome test are specified in BS 3668:1963. Unfortunately, things are not quite that simple. Ivanof (1949) reported that the wavelength focused on the retina appeared to change with target distance although the amount of ACA remained fairly constant. Millodot and Sivak (1973) confirmed these findings with and without cycloplegia, and suggested a conditioned response designed to lessen accommodative demand. Red light is focused preferentially when the target is remote, but the preferred wavelength shifts progressively towards the blue end of the spectrum as the target distance becomes shorter. This could have implications for the practitioner in the determination of the spherical refractive error. If, as is customary, the power of the correcting lens is adjusted to give equal clarity of red and green targets (equalisation), it may result in a slight under-plussing or over-minusing for a distant target. However, most distance test charts are situated at 6 or 3 m rather than true infi nity, so a little underplussing probably works out quite well. For modern collimated charts, however, which do present the target at true infinity, there may be a slight tendency to under-plus if the duochrome is equalised. When using the duochrome test, the two colours should appear equally bright. For the colours used, the eye’s dioptric power differs by about 0.50 D. It is important to note that the coloured filters are simply used to present the targets (black circles, dots or letters) to the patient and the judgement is based on defocus blur not brightness. Patients can get confused over this, so it is important that the practitioner carefully phrases the instructions to the patient. If the black targets appear equally clear to the patient, the red and green foci are dioptrically equal either side of the retina. This is a result of the 0.50 D interval between the eye’s powers for the two colours (red and green) and the black targets are equally clear (or blurred) to the patient. From the position of equality, if a +0.25 D sphere were placed before the eye, both the red and green foci would move to the left by 0.25 D. As a result of the 0.50 D interval, the red focus is on the retina and the patient reports that the targets on the red background appear clearer and those on the green appear blurred. Adding a +0.25 DS therefore moves the red focus on to the retina and the black targets will appear clearer on the red. Again from the position of equality, if a −0.25 D sphere is placed before the eye, both the red and green foci move to the right by 0.25 D. As a result of the 0.50 D interval, the green focus is now on the retina and the patient now reports that the targets on the green background appear clearer and those on the red appear blurred. 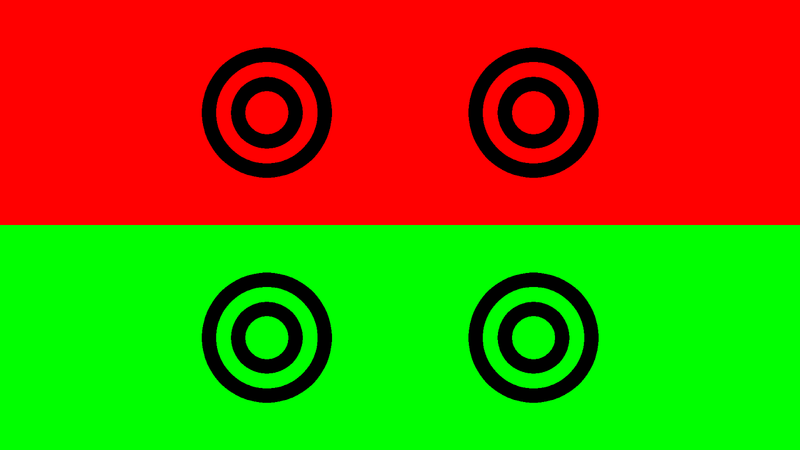 Addition of a −0.25 DS therefore moves the green focus onto the retina and black targets are clearer on the green. As with all subjective techniques, the questioning is critical. The patient should be asked whether the circles look ‘darker and clearer on the red background or the green background, or both about the same’. When using the duochrome, there may not be an exact endpoint because the chances of the spectacle refraction falling into a 0.25 DS endpoint are fairly remote. If it is not possible to balance the red and the green equally, the duochrome is usually left ‘on the red’ to avoid over-minusing, as long as this does not have a detrimental effect on the VA. When refining the near addition, it is common to leave the patient ‘on the green’. Another situation where a bias towards the green may be useful is a patient who needs spectacles for night driving because there is a tendency for the eye to become more myopic under conditions of low illumination. If the duochrome test is used before checking for astigmatism, the end-point of the test depends on the chosen method of astigmatic refinement. For the cross-cylinder technique, the targets on the duochrome should be balanced or marginally ‘on the green’, so that the patient accommodates to place the disc of least confusion on the retina. For the fan and block method, it is usual to leave the patient ‘on the red’. The duochrome test was first described by Brown in 1927. It was reintroduced by Freeman (1955) after an extended lapse into disuse. The modern duochrome test used in the consulting room uses circles, letters or numbers on red and green backgrounds. Polasky (1991) noted that darkening the room dilates the pupil and therefore slightly increases the chromatic aberration of the eye. It also reduces veiling glare somewhat, although few practitioners routinely dim the lights when employing the duochrome test. There are a number of other factors that may influence the end-point obtained. The filters are chosen such that their focal points are 0.50 D equidistant from the focal point of the ‘reference wavelength’, which for tungsten light is 570 nm. However, not all duochrome tests use the same peak wavelengths, so the dioptric interval may vary a little from test to test (Mandell and Allen 1960), and the relative brightness of the red and green panels may also affect the end-point. Ageing or inappropriate light sources, dirty or fading filters and the reflectance of the chart surface may all have some slight affect on the end-result. With increasing age, a yellowish pigment accumulates in the crystalline lens. The lens becomes optically denser to shorter wavelengths so that the red background always appears brighter. This means that the duochrome test may over-minus (or under-plus) the elderly patient. In addition, the chromatic aberration of the eye reduces after age 55 and the pupil tends to become smaller. These effects lead to a reduction in the distance between the red and green foci and therefore a reduction in the difference between the blur of the targets on the two colours of the duochrome. The duochrome is unreliable if the defocus blur is more than 1.00 D from the patient’s correct spectacle refraction as the targets on the red and green are so blurred as to make a comparison meaningless. The duochrome is of no real value until the ametropia has been corrected to the point where the acuity is at least 6/12. At any age, if the targets on the green background are clearer, the result is unambiguous. There is uncorrected hypermetropia and more plus power needs to be added. If the targets on the red panel are clearer the situation is more complicated. Either there is uncorrected myopia, or the patient has yellowing of the crystalline lens or is accommodating. Therefore, if the patient is favouring the red background rather more than expected, it is worth checking the result with an alternative method. Fletcher (1991) also recommends that, in young patients, once equality has been achieved between red and green, an extra +0.50 DS be placed before the eye for a few seconds. This is then removed, and the patient asked on which colour the targets are clearer. It is not unusual to find a little extra plus when this is done. Given the number of factors that may influence the result, it is perhaps surprising that the duochrome test is a popular as it is. However, practitioners tend to adapt their methods and prescribing preferences to the consulting room in which they are working. As with many clinical methods, accurate and consistent results are obtainable provided that the practitioner knows when to adapt. However, working in an unfamiliar environment may produce the odd interesting result. As patients with poor VA may have difficulty in determining small changes in lens power and clarity, it is often necessary to make large power changes. A bracketing technique can be employed, e.g. use a +2.00 DS trial lens and compare this with a −2.00 DS trial lens. If the patient is able to differentiate between the two, the lens giving the better vision can be added and the technique repeated using, say, a +1.00 DS and a −1.00 DS lens, etc. It may be necessary to refract the patient with the chart placed at 3 m or less. If this is done the result is over-plussed (the chart at 3 m acts as a near object and therefore adds a vergence of about −0.30 D in the plane of the trial lens) and a correction should be made. The use of a pinhole disc is essential when vision is poor, in order to attempt to differentiate a refractive error from active pathology. The earliest instrument employed to assess refractive error was based on a principle described by Christopher Scheiner in 1619 (Bennett 1998). This trial case accessory is an opaque disc (the Scheiner disc) with two small circular apertures each 0.75 mm in diameter, 2–3 mm apart and equidistant from the centre in opposite directions along a common meridian. These dimensions allow light through both holes to enter the eye’s pupil. The Scheiner disc is effectively a subjective optometer that can be used to detect and measure spherical ametropia. It is a somewhat outdated technique that is rarely used in optometric practice. However, the Scheiner disc can be used to demonstrate the existence of accommodation and is also used as the focusing mechanism in the one-position keratometer and some autorefractors. To detect and measure spherical ametropia, the Scheiner disc is used ith a spotlight at 6 m and is placed before one eye only, the other eye being occluded. If a point source of light at 6 m is viewed using the disc, the image is formed through two different portions of the pupil. If the viewing eye is emmetropic, the two images thus formed are coincident and focused. The individual sees a single spot of light. Simple myopia causes the target to be imaged in crossed diplopia, whereas hypermetropia without accommodation produces uncrossed diplopia. The separation of the two retinal images depends upon the degree of ametropia present and the type of ametropia may be found by covering one of the two pinholes. If the upper pinhole is occluded, the lower retinal image disappears in a myopic eye. As a result of retinal inversion, this is perceived by the patient as the disappearance of the upper image, whereas someone with hypermetropia reports the absence of the lower one. Scheiner also described a version of the disc with three pinholes distributed in an equilateral triangle. The type of refractive error could then be determined by whether the observer saw an erect or inverted triangle of images. Spherical lenses may be interposed between the target and the eye to bring the diplopic images to coincidence and thereby determine the ametropia of the eye along the selected meridian. The Scheiner disc is rarely employed in subjective refraction in the consulting room, although it may be useful with those patients who are unable to cope with the more commonly employed methods. • The disc is difficult to centre correctly. • The central part of the eye’s optical system is not used during the test. • The measurement of astigmatism is difficult. • The patient’s accommodation may not be relaxed during the test. Refraction consists of three phases, the first of which is the correction of the spherical element of the refractive error. There are a number of methods available to achieve this and each has inherent advantages and disadvantages. Experience helps the practitioner to select the best method for a given patient. It also informs the practitioner of those intuitive corrections that need to be made to allow for variations when using particular methods in a particular consulting room.